"In September 2013 I conducted an internship at the High Atlas Foundation, one of the organizations in the 14km volunteer programme. 14km had facilitated the contact and position according to my preferences and the environment-related degree I study in Austria. After two days working and volunteering in the office of the High Atlas Foundation (HAF) in Marrakech I got the opportunity to spend three weeks in Amsouzerte which is located in the Tifnout Valley of the High Atlas Mountains, close to Mount Toubkal and Lake Ifni. At my arrival it was dark and I could not see where I was. So I had to wait until the next morning to see the picturesque valley with a river paving its way through, passing vegetated terraces, trees ready for the harvest and the clay made houses of the region - all of it surrounded by rocky mountains. But not only that; I also realized that I am going to stay here in this beautiful area for the next three weeks speaking no word of Tashelhyt, Arabic or French. This could only become an exciting cross-cultural stay, which is what I asked for! On the first day El Mahjoub, the head of the family I was living with, showed me around the village. He introduced me to a dozen people and after came the same amount of invitations for tea. Fatima then showed up; she is HAF's community planning facilitator and supports the organic agricultural project. She was the one who watched out for me. At the moment she is responsible for 48 villages in the area and very busy with the certification of walnut and almond trees. The first week Fatima tried to give me a few insights into her work. Every morning after breakfast Fatima also gave me some lessons in Tashelhyt, before we went to visit some villages, project sites or people to meet. So, I was quite well prepared for my stay. This was the time when communication became interesting; especially with the older men, it took me a while until we were able to interact with eachother, not only sitting there in silence. Out of these difficulties some made up stories arose, spreading very fast around the whole village. One was that I am the son of Yossef, the President of the Foundation who had spent some time in the area in the 1990s as a Peace Corps Volunteer. With the younger generation it was quite easy to talk. They had patience, curiosity, were not afraid of ridiculous situations and were happy teachers too. Mohammed was one of them. He drives a very old French Berliet truck and is employed by El Mahjoub. During the second week he was so kind to take me with him to his work. We started early in the morning, driving in the river bed. We had to get soil, hidden between many different sized stones onto the truck. Then it was time to get back onto the truck, heading on narrow dirt roads into the mountains, where the terrain drops down steeply, to deliver the load. That was the time when I slowly got a bit of an insight into people's daily life. It consists of a lot of physical work and the roles are strictly allocated whereupon you don't exactly know whose part the harder one is. While the women are busy with cooking, caring for the kids and the households, the men are dealing with cutting wood, construction work and other labor, often assisted by mules or donkeys. Mohammed was also the one who introduced me in the secret of preparing the well known mint tea, also called Moroccan Whisky, consisting of one-third of sugar, which can be a real spectacle/show. In the evening I met with the guys to play football, or went up the mountains to witness the sunsetting, throwing a nice light onto the valley and its villages, where Amsouzerte is the nicest one of all, having the most beautiful landscape with a lot of green vegetation. When the HAF's Vice President arrived, we examined tree nurseries, had a look at some other sites were HAF is working and talk to people who are responsible for monitoring the quality of the trees. Even with little language skills, it was very interesting for me to get a better understanding of the Foundation's approach. And suddenly the last days of this wonderful stay came. But it was not the end yet. Fatima had some impressive moments to share, when we helped the women collecting walnuts and when she took me to a remote village where she showed me the lives of a very old couple that had to live separated, due to illness. Finally I had to leave this place where everyone is welcome and where everybody takes care of you without knowing you and your background, your attitude and work, and without a common language; a place where you don't know what would happen in the next minute or what the next day would bring." The published reports by interns/volunteers on their internships facilitated by 14km e.V. do not necessarily reflect the opinion of 14km e.V. or its partners. "In September 2013 I conducted an internship at the High Atlas Foundation, one of the organizations in the 14km volunteer programme. 14km had facilitated the contact and position according to my preferences and the environment-related degree I study in Austria. After two days working and volunteering in the office of the High Atlas Foundation (HAF) in Marrakech I got the opportunity to spend three weeks in Amsouzerte which is located in the Tifnout Valley of the High Atlas Mountains, close to Mount Toubkal and Lake Ifni. At my arrival it was dark and I could not see where I was. So I had to wait until the next morning to see the picturesque valley with a river paving its way through, passing vegetated terraces, trees ready for the harvest and the clay made houses of the region - all of it surrounded by rocky mountains. But not only that; I also realized that I am going to stay here in this beautiful area for the next three weeks speaking no word of Tashelhyt, Arabic or French. This could only become an exciting cross-cultural stay, which is what I asked for! On the first day El Mahjoub, the head of the family I was living with, showed me around the village. He introduced me to a dozen people and after came the same amount of invitations for tea. Fatima then showed up; she is HAF's community planning facilitator and supports the organic agricultural project. She was the one who watched out for me. At the moment she is responsible for 48 villages in the area and very busy with the certification of walnut and almond trees. The first week Fatima tried to give me a few insights into her work. Every morning after breakfast Fatima also gave me some lessons in Tashelhyt, before we went to visit some villages, project sites or people to meet. So, I was quite well prepared for my stay. This was the time when communication became interesting; especially with the older men, it took me a while until we were able to interact with eachother, not only sitting there in silence. Out of these difficulties some made up stories arose, spreading very fast around the whole village. One was that I am the son of Yossef, the President of the Foundation who had spent some time in the area in the 1990s as a Peace Corps Volunteer. With the younger generation it was quite easy to talk. They had patience, curiosity, were not afraid of ridiculous situations and were happy teachers too. Mohammed was one of them. He drives a very old French Berliet truck and is employed by El Mahjoub. During the second week he was so kind to take me with him to his work. We started early in the morning, driving in the river bed. We had to get soil, hidden between many different sized stones onto the truck. Then it was time to get back onto the truck, heading on narrow dirt roads into the mountains, where the terrain drops down steeply, to deliver the load. That was the time when I slowly got a bit of an insight into people's daily life. It consists of a lot of physical work and the roles are strictly allocated whereupon you don't exactly know whose part the harder one is. While the women are busy with cooking, caring for the kids and the households, the men are dealing with cutting wood, construction work and other labor, often assisted by mules or donkeys. Mohammed was also the one who introduced me in the secret of preparing the well known mint tea, also called Moroccan Whisky, consisting of one-third of sugar, which can be a real spectacle/show. In the evening I met with the guys to play football, or went up the mountains to witness the sunsetting, throwing a nice light onto the valley and its villages, where Amsouzerte is the nicest one of all, having the most beautiful landscape with a lot of green vegetation. When the HAF's Vice President arrived, we examined tree nurseries, had a look at some other sites were HAF is working and talk to people who are responsible for monitoring the quality of the trees. Even with little language skills, it was very interesting for me to get a better understanding of the Foundation's approach. And suddenly the last days of this wonderful stay came. But it was not the end yet. Fatima had some impressive moments to share, when we helped the women collecting walnuts and when she took me to a remote village where she showed me the lives of a very old couple that had to live separated, due to illness. Finally I had to leave this place where everyone is welcome and where everybody takes care of you without knowing you and your background, your attitude and work, and without a common language; a place where you don't know what would happen in the next minute or what the next day would bring." Die von uns wiedergegebenen Berichte von durch uns vermittelte Praktikant/innen spiegeln nicht notwendigerweise die Sichtweise von 14km e.V. oder unseren Partnern wider. The published reports by interns/volunteers on their internships facilitated by 14km e.V. do not necessarily reflect the opinion of 14km e.V. or its partners. "Die Uni hat wieder begonnen und ich bin dieses Jahr ausgesprochen motiviert in das neue Semester gestartet, denn in den Semesterferien habe ich motivierende Erfahrungen in der mich erwartenden Arbeitswelt gesammelt. Ich blicke auf ein schönes zweimonatiges Praktikum in dem jungen Verein ‚14 km – the shortest distance between North Africa and Europe e.V.‘ zurück. Auf den Verein bin ich über eine Freundin aufmerksam geworden. Da der Verein thematisch sehr viel zur arabischen Region arbeitet und ich mich insbesondere für diese interessiere, habe ich mich spontan auf einen Praktikumsplatz beworben. Ehrlich gesagt war ich ein wenig verunsichert, denn Praktika können sehr anstrengend und uninteressant sein, doch das ging mir in dieser Zeit bei 14 km e.V. gar nicht so. Im Gegenteil, das Praktikum hat mir sehr viel Spaß bereitet und darüber hinaus neue Impulse für mein späteres Berufsleben gegeben. Ich habe im Allgemeinen einen sehr bereichernden Einblick in die Vereinsarbeit bekommen und durfte selbständig an spannenden Projekten mitarbeiten. Beispielsweise half ich bei der Organisation der Arabischen Film und Diskussionsreihe. In regelmäßigen Abständen zeigt der Verein Filme, die sich mit verschiedenen arabischen Ländern beschäftigen und diskutiert anschließend mit Experten/innen und dem Publikum über das Thema des Films und die aktuelle soziale und politische Situation im jeweiligen Land. Die Film- und Diskussionsreihe soll über arabische Länder informieren, sowie den interkulturellen, arabisch-deutschen Austausch auf der lokalen Berliner Ebene fördern. Ich durfte den Verein bei der Vor- und Nachbereitung sowie Durchführung von vier Veranstaltungen zu den Ländern Ägypten, Palästina, Syrien und Jordanien unterstützen. Ich half bei der Suche geeigneter Referent/innen sowie beim Akquirieren von Geldern für die Film- und Diskussionsreihe, indem ich gemeinsam mit Anja Gebel, der Projektmanagerin von 14 km e.V., einen Antrag auf finanzielle Förderung schrieb. Der Antrag wurde kurze Zeit später genehmigt und vermittelte mir schon zu Beginn meines Praktikums ein wunderschönes Erfolgserlebnis. Zu der Organisation der Filmveranstaltungen gehörte auch eine wirksame Öffentlichkeitsarbeit. Ich durfte kurze Ankündigungs- und Reflexionstexte für die Website und für den Bereich Social Media verfassen, sowie Einladungen schreiben und versenden. Diese inhaltliche und organisatorische Unterstützung der Arabischen Film- und Diskussionsreihe hat mir besonders viel Spaß gemacht, zumal ich bei den einzelnen Veranstaltung selbst sehr viel von den Experten/innen und Teilnehmer/innen dazu lernen konnte. Das Titelbild dieses Beitrags zeigt den Jordanien-Abend am 10. Oktober im Filmrauschpalast, zu dem ich meine deutsch-jordanische Austauschgruppe mitbrachte, die aktiv an der Abendgestaltung mitwirkte. Hier geht es zur Reflexion über den Abend. Ein weiteres spannendes und schönes Erlebnis war der Tag an der Sancta Maria Schule in Berlin, in welcher Anja Gebel und ich im Rahmen einer Afrika-Projektwoche den Schüler/innen durch verschiedene Aktivitäten das Land Ägypten näher brachten. Da ich in meinem Studium Arabisch lerne, bekam ich u.a. die Möglichkeit, den Schüler/innen ein paar Worte auf Arabisch beizubringen. Dieser Vormittag in der Schule hat mir sehr viel Spaß gemacht und es hat mich gefreut, dass ich den Tag mit meinen individuellen Stärken bereichern konnte. Hier gibt es einen ausführlichen Bericht zur Aktion. In meiner Zeit als Praktikantin habe ich auch administrative Aufgaben für den Verein übernommen, wie zum Beispiel Netzwerk-Pflege, Recherche-Aufgaben, Erstellung von Listen und Beantwortung von E-Mails und Anfragen. Diese Aufgaben haben aber nur einen kleinen Teil meiner Arbeitszeit in Anspruch genommen. Mein absolutes Highlight war, dass 14km mir vorgeschlagen hat, mir ein eigenes Projekt zu überlegen, welches 14 km e.V. in näherer Zukunft durchführen könnte. Zusammen mit Anja Gebel konzipierte ich die Idee eines Interreligiösen Jugendaustauschs zwischen Ägypten und Deutschland zum Thema religiöse Minderheiten in beiden Gesellschaften. Bei der Konzipierung dieses Projektes durfte ich meine eigenen Ideen einbringen und Ziele, Methoden und Programmpunkte im Projekt mitkonzipieren. Ich bin sehr stolz auf das gemeinsame Ergebnis, das Anja und ich erarbeitet haben und wünsche mir, dass dieses Projekt nächstes Jahr in die Realität umgesetzt wird. Meine Praktikumsbetreuerin Anja Gebel hat mich bei meiner gesamten Arbeit immer unterstützt, sich viel Zeit genommen und mir viele Tipps gegeben. Durch dieses individuelle Feedback habe ich besonders viel dazu gelernt und meine persönlichen Fähigkeiten in vielen Bereichen verbessert. Letztendlich möchte ich mich für die schöne Praktikumszeit bei 14 km bedanken und wünsche dem Verein in der Zukunft alles Gute. Ich möchte mich neben meinem Studium weiterhin ehrenamtlich für 14 km e.V. engagieren und alle Fans von 14 km e.V., die gerne den Verein kennenlernen und unterstützen möchten, zu einem Praktikum bei 14km in Berlin ermutigen. Vielen Dank 14 km, vielen Dank Anja Gebel!" Johanna Kramer Die von uns wiedergegebenen Berichte von durch uns vermittelte Praktikant/innen spiegeln nicht notwendigerweise die Sichtweise von 14km e.V. oder unseren Partnern wider. Last Thursday 14km e.V. 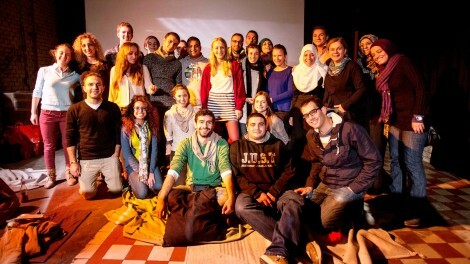 successfully conducted the fourth evening of our Arab Film and Discussion Series. We were happy to welcome around 70 participants for our film evening on Jordan, of which 30 came as part of a German-Jordanian student exchange (organised by Bürger Europas e.V. with the support of the German Foreign Office). 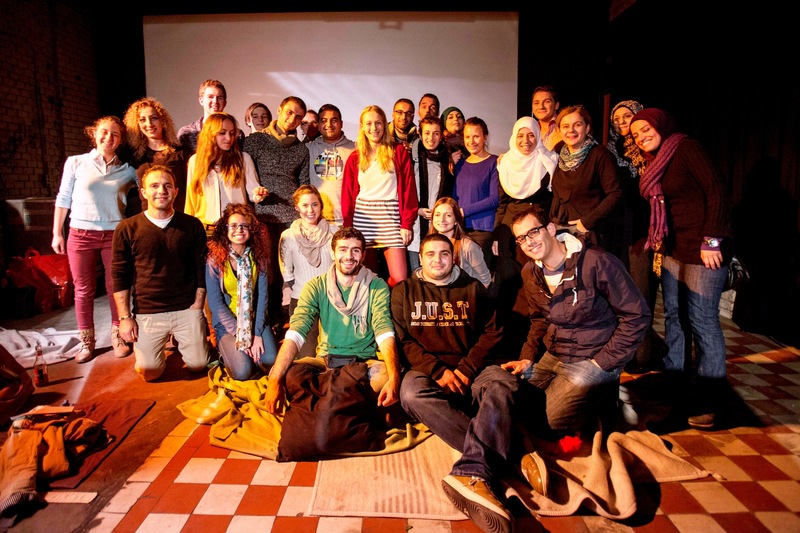 In the cosy atmosphere of stove-heated Filmrauschpalast cinema inside the Kulturfabrik in Berlin Moabit we screened the film “Recycle” which tells the story of an ex jihadist who lives in one of the poorest areas of the Jordanian city Zarqa. He collects waste-paper in order to make a living for himself and his family – difficult circumstances in which religion is an important foothold for him. But the lack of social and economic prospects and permanent setbacks drive him to the brink of desperation. After the screening the film was lively discussed by the present Jordanians, especially with regards to the question whether the film characters and their lives are representative for the Jordanian society or not. The following panel talk and the audience discussion with the guest speakers Hanna Al-Taher and Dima Al-Kuttu focused on the one hand on Jordan as an immigration country and current target of numerous refugees from Syria, and on the other hand on social and political transformations in the country since 2005 and 2011. 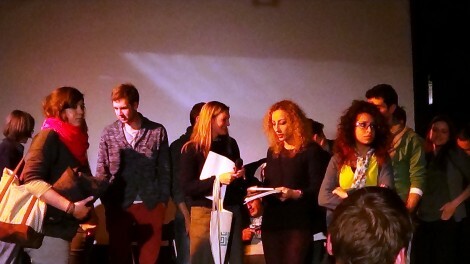 The event was presented by Anja Gebel (14km e.V.). We cordially thank all participants for the interest and vivid participation, and the Filmrauschpalast team for the excellent preparation and technical support!